During the nations worst drug and public health crisis, a new report from Ohio county is dramatically lowering the number of opioid-related overdoses. As reported by CBS, the number of overdose deaths have reduced by 31 percent in Hamilton County, including areas in Cincinnati. The report also included a 42-percent drop in emergency room visits. Health experts credit the new program that will give away the over-dose-reversal drug Narcan for no cost. According to CBS News, 115 American die every day from an Opioid-related death. Don Dahler a reporter for CBS and his team traveled to Hamilton County to speak with people who are dealing with the crisis first hand. A local from the county Kathie Mead shared her story with reports saying, “It’s just heartbreaking what’s going on out there, and it’s got to stop… It’s an awful thing for a mom to go through.” Her daughter Amy, struggled with addiction from age 14-30. “Every time my phone would ring, I would think, ‘Is this a coroner’s office calling for me to come and identify her body? '” Mead said. Amy Parker, Mead’s daughter, even admitted to using the drug while carrying her child, Chloe. However, Chloe isn’t the only one suffering from addiction, more than 2.5 million children are living with grandparents because of a parent’s addiction. “It makes me feel sad because—that she wasn’t really around for most of my life. And, well, she missed out on important milestones,” said Chloe “It’s hard for me to look at photos of her when she was young because I wasn’t there… when she took her first steps. I wasn’t there when she started school,” Parker said. Tim Ingram, the Hamilton County public health commissioner, believes opioid addiction has become a “huge problem” in the surrounding areas. The state of Ohio had 4,854 accidental drug overdose deaths last year with 444 of those being in Hamilton County. The solution? An opioid-reversal drug known as Narcan, which can revive the patient within seconds. Since last year, the program which distributes Narcan has handed out more than 37,000 Narcan doses to the public for little to no cost. “We got this idea… ‘What would happen if we saturated the community, removed the cost, used data to put Narcan out in as many hands as possible? '” Ingram said. 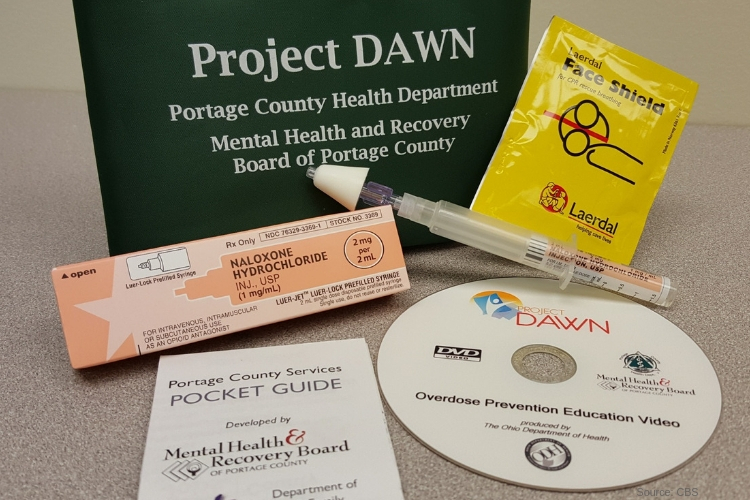 Since the program’s debut Project Dawn , overdose-related deaths have decreased by 31 percent and emergency room runs dropped to almost 40 percent. Reporters who saw the program in action with a team of first responders in Hamilton County said that last year, they saw around eight overdose calls a day. This year, that dropped to about five, and the day that CBS was on the scene, they reported: zero. Parker was given a second chance because of Narcan. She has been sober for around six years and now believes she can help others in recovery. “That overdose saved my life,” Parker argued. The life-saving drug Narcan contains the medicine naloxone. Which targets the brain in order to reverse and block the effects of opioids. Naloxone does not reverse overdoses that are caused by non-opioid drugs, such as cocaine, benzodiazepines (e.g., Xanax, Klonopin and Valium), methamphetamines or alcohol. Narcan can be found at any pharmacy without a prescription. Many insurance companies will cover the cost and in some areas it is free. The Recover is an unbiased substance abuse and mental health news provider. Helping individuals looking for the right treatment programs in their area. Also providing information on Ohio drug rehab centers for addiction recovery.